WellBridge of Novi offers leading edge rehabilitation and senior care services in a licensed, 100-bed skilled nursing facility. The 67,000 sq ft building is sited on a wooded plot of land in Novi, Michigan, and is surrounded by protected woodlands and wetlands. The building evokes transitional residential styling in its form and material selections, harmonizing with nearby domestic architecture as suggested by the City of Novi’s community development department. Great care went into analyzing and protecting the existing habitat of an endangered bat that roosts on the property. The owner committed significant funding to a ½ mile bike path that traverses a wooded portion of the site as part of the city’s master plan for a network of paths. Inside, spaces and programming elements are inspired by modern hospitality environments rather than common institutional nursing homes. Barriers to care like nurse stations have been eliminated in favor of discrete, wireless paging systems. Dining is available in a variety of settings, including a central coffee house, restaurant-quality dining rooms, and room service. Therapeutic treatment areas include a pool, salon, massage room and sauna, in addition to a light-filled therapy gym. The challenge of designing and building a facility that matched the owner’s philosophy of care while meeting the city’s prescriptive requirements was achieved through the well-coordinated efforts of the architect, contractor and the entire planning and development team. As the facility opened in April of 2014, positive social, environmental and economic impacts were realized, and continue to grow on a local and regional level. This facility provides the region with access to leading edge skilled nursing and rehabilitation options. There are 80 private resident rooms and 10 semi-private rooms. The site has a back-up generator to fully produce emergency power for the entire facility. The facility operates 24 hours per day, 7 days a week as a skilled nursing facility. In addition to the exceptional physical and occupational therapy suite, a therapy pool, sauna, spa, salon and a coffee house are integrated into the facility. The interior spaces are specifically designed around the philosophy of person-centered care. This concept involves putting decision-making and control in the hands of the patient or resident, despite any frailties or impairments that may exist. The City of Novi takes great pride in protecting its open spaces and natural habitats, and has set forth prescriptive guidelines for construction projects in order to limit their impacts to all possible extents. Before final design and construction of the building could begin, the existing woodlands and wetlands on the site were carefully examined. After an environmental impact study was completed, JW Design drafted multiple solutions for site layouts, arriving at a design that offered minimal impact to the natural environment while meeting the needs and desires of the owner. Meticulous care went into planning new landscaping so that it would complement the native plants and existing terrain. Special measures were also taken in order to encourage an endangered species of bat to safely relocate to a protected area. One of the requirements from the City of Novi was to incorporate an ITC bike path into the new facility grounds to further the vision of creating a bikeable community. It was essential for the bike path design to be compliant with ITC standards while preserving as much of the woodland and wetland features as possible. To meet all of the planning requirements, an earlier iteration of the proposed site plan was fully revised. A prime location for the path was selected, and construction materials and landscaping specifications proceeded with reverence for the location. Despite all of the challenges, JW Design, Livingston Engineering, Braun Construction Group, the City of Novi, The WellBridge Group and ITC were able to devise a beautiful, functional path that enables non-motorized accessibility through a scenic site. 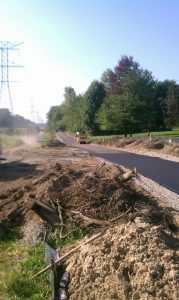 Construction of the ITC bike path. With any new construction, there are challenges in meeting client expectations and satisfying the demands of their programming requirements. WellBridge of Novi was particularly challenging due to the owner’s progressive person-centered approach to providing care, wellness, and rehabilitation. Of utmost importance was the idea of eliminating the physical barriers to care that are so common in skilled nursing facilities. A key concept in this philosophy is that staff and residents are not separated by desks, or carts; medications, linens and cleaning supplies are located in each individual room versus in a central storage location. All of this facilitates the maximization of caregiver contact and time with the resident. JW Design had to rethink traditional elements of nursing facilities to accommodate this setup. The creation of a one-story facility is a key advantage to operating a modern nursing facility. The elimination of stairs and elevators are important to protecting the residents during their rehab, as well as to staffing concerns. However, the City of Novi required a multi-story appearance for the exterior of the building. While this allowed for the upward expansion of some interior spaces, it also required new maintenance access challenges for the large attic spaces and a concealed mechanical pit. Braun Construction and JW Design devised a series of catwalk systems that provided access to the remote equipment and spaces. Highly integrated technology is another key to supporting the type of care required in this new model of a skilled nursing facility. The technology must be discrete when necessary. For instance, wireless nurse call systems are integrated with cell phones and pagers as opposed to flashing call lights and disruptive overhead paging systems. Digital room displays are integrated with room signs, with current information on the resident like their name and any special medical requirements. Each room has independent heating and cooling controls, televisions with Skype access, and wireless internet. As an important component of health and wellness, the many demands of daily food service were reexamined in order to better align the nutritional and the social aspects of dining with the complexities of providing multiple options within a health care setting. Traditional nursing home standards such as large, institutional cafeterias were eschewed in favor of restaurant-quality menus and environments. Residents have the option of room service, dining in a range of private and public spaces, and a 24-hour coffee house and café. These choices necessitated a kitchen with space for a complete kitchen staff and head chef as well as a computerized ordering and delivery system. The owner’s revolutionary take on food service meant new design challenges for this project. All food services areas were grouped around the main kitchen as a core component of the entire facility. 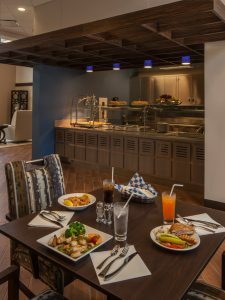 This design decision maximized staffing and logistical efficiencies while allowing a range of differently themed serving areas to access both the public and back-of-house spaces as required. As the kitchen has become the heart of the modern home, the dining amenities at WellBridge of Novi are the central social features of the entire facility. The concept of therapeutic treatment is no longer simply the dedication of spaces to physical therapy and occupational therapy. The owner’s program called for the development of a therapy and wellness suite, where a therapy pool, spa, salon and an exercise gym are paired with the more traditional elements of therapy. A practice kitchen, laundry, and bathroom assist the resident with managing the efforts of daily living, with the intention of returning to their private residence with essential skills that help to maintain their independence. Once again, the owner’s philosophy of care can be seen in the way that the built environment balances with the natural environment. Maintaining connections to the outside world are, quite literally, accomplished through ease of access to the outdoors. Holistic and alternative treatments as supplemental healing options are complemented by the access to nature provided by walking paths, outdoor dining areas, and interior views to the nearby natural landscape. The building’s angular orientation on the 20 acre site was the result of several limitations. With an 8 acre protected woodlands easement and 4 acres of wetlands, approximately 8 acres of buildable site remained. Grading of the existing topography was limited, and the site was balanced. Another benefit to the community is the facility’s proximity to Providence Park Hospital, a major regional medical center. This makes transportation to and from the hospital less stressful for residents and their families while adding efficiency to the transfer of care process. WellBridge of Novi, in addition to being an asset to the city of Novi and other nearby communities, is a regional asset due to its adjacency to the medical center and to Interstate 96. Finally, the 20 acre site was originally zoned as One-Family Residential. As a component of the request to rezone the site to Multi-Family Residential in order to accommodate the construction of a nursing home, a traffic impact study was conducted. The study found that the proposed development would have a significantly lower impact than both the land use under the existing zoning as well as the maximum land use under the proposed zoning. The anticipated traffic volumes would be almost half when compared to the existing zoning category. The owner dedicated a significant portion of the project’s landscaping and site development budget toward installing a bike path adjacent to and across the site, connecting 11 Mile Road with a new path across the northern portion of the site. Already, the facility is hosting visitors from other health care providers in order to demonstrate that a premiere level of care can be achieved within the strict federal guidelines for Medicare and Medicaid. This facility is offering a level of care that is commonly associated with exclusive, ‘private pay’ facilities, making WellBridge of Novi an inclusive provider of health, wellness and rehab. Approximately 60% of the 20 acre site was maintained as protected woodlands and wetlands. Traffic impact was shown to be less than the existing zoning category. WellBridge of Novi will become a key employer in the city. The infusion of employees, residents and visitors will contribute to a multiplier effect upon the local economy. The $15M facility will add to the local tax base for years to come.